U.S. Congresspersons and U.S. 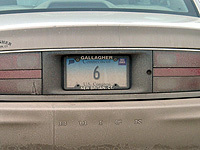 Senators receive distinctive license plates to use on their vehicles while they are serving their term. These plates were first issued in the 1940s or 1950s with a black on silver color scheme. The original captions were "U.S. Congressman" and "U.S. Senator". Reflective white scotchlite plates were used in the 1950s. These plates have traditionally been of the same design as Official plates, but with the respective legends and single-digit serials.